Visit the Seychelles, an archipelago of 115 remote islands off the coast of Africa, and you'll find hardly a footprint in the sand. The islands have remained largely untouched and unchanged over the years because of enlightened tourism policies. Traveler Editor in Chief Keith Bellows, having just returned from a trip to the Seychelles, talks about why this corner of the world is truly remarkable and why it just might stay that way. What's the best way to experience the Seychelles? By water. When you stand on the beach and look out, you see the amazing blue of the water, and that's all very well. But when you get on a boat, you see the Seychelles in a completely different way. 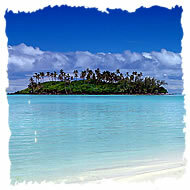 These are islands seen from the water that have a sort of Robinson Crusoe-like quality. On many, there's no human presence; they're totally, totally pristine. What is the culture like, and what languages do the locals speak? There are only 80,000 people here. The people are very friendly but fiercely protective of their land. You're very aware that they just don't want to mess up what they have, their environment or their culture. They speak French, Creole, and English. If you look at their food, there's a strong French component, but also an English component. So it's a very unique kind of melting pot. 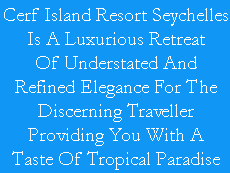 Is tourism a major industry in the Seychelles? They are now realizing how important tourism is. But there are so few people on the island who really know how to cater to tourists. A hotel training school has been set up to teach people how to enter the hospitality industry, and this is a stepping stone to prosperity. So clearly the tourism industry is their industry of the future. Many work at government agencies like the department of the environment, which currently employs 200 locals, making it the largest department on the Seychelles. With a total population of 80,000, that's a significant proportion of people. What kinds of hotels will visitors find? The government has a very strict policy about what can and cannot be built. Environmental impact studies must be done, and the builder has to make sure they do not in any way deface the character and landscape of the Seychelles. There are a lot of little places and some chain hotels, like the Banyan Tree Resort, a small Asian franchise that built its business on the idea of sustainable tourism. The Banyan Tree has its own desalination plant, its own spa school, and its own sewage treatment plant. Hotels on the island don't change the landscape at all—they adapt their entire building plan around the existing landscape to conform to the foliage and vegetation. It's quite extraordinary. The government also issues a one-time fee of 0 to all visitors over age 12. For that fee, you get an environmental visa called the "Seychelles Gold Card" and the money goes toward protecting, managing, and improving the islands' green spaces. Is this visa effective, in your opinion, and will other nations follow suit? It's very effective. When visitors realize that their money is going to preserve the physical plant of the country, then people are happy to pay that. What they're not happy to pay is some faceless fee to get in and out of a country because it's an airport tax, and they don't know where their money is going. Part of the reason the Seychelles remains pristine is because it's not on the garden-variety tourism track. This year they will host 130,000 tourists. They want to increase that number to 200,000 tourists by the year 2012—but no more than that. They're not interested in mass-market tourism, they're interested in niche-market tourism, which means they're really only attracting a certain kind of tourist. And they're basically saying to everybody else, "Stay away." It's a very gutsy move. Economically, can this cap on tourism last? Yes. A destination can either go for volume or for quality. If you go for fewer people who spend ,000 a day versus lots and lots of people spending 0 to 0 a day, you've got a much better building block on which to erect your tourist industry. If you look at the Caribbean as an example, the islands that have done well in the long run, like Montserrat or St. Barts, have been selective about their customers. They've been selective by pricing a certain customer out or by limiting the physical plant to appeal to a certain kind of person. So are certain destinations going to get pricier? Many will, yes. If you go to a national park in 15 or 20 years, it's either going to be more expensive to get in or you won't be able to get in unless you book years in advance. The harder it is to get in, the more people want to go. So the more you pique demand the more you charge for it, and by inverse portion you have fewer footprints in the sand. So in five years, how do you see the Seychelles doing? Here's what I was told by a guy who's developing a resort on the island. He said, "Our goal is that your son will visit and then come back here in 30 years and say it hasn't changed a bit." That's a pretty great goal. The Seychelles is, to me, the quintessential exercise in preserving a destination as it was and is. It's 2002, and these islands are pretty much the way they were in 1950. In 1974, the only way you could get there was by steamer. There was no airport. Now there's an airport, but there are only a couple of direct flights a day. So keep your fingers crossed that the Seychelles won't change. So far, so good.